Day 3 of the Trofeo Princesa Sofia Iberostar regatta on Mallorca and as we reach mid-point of the qualifcation races the pressure to reach the Top 10 grows. No more so then for New Zealand’s Peter Burling and Blair Tuke who stuttered at the start but are getting back into that winning groove. After two warm-up races they hit the front in race 3 and steadied with a 5, 7, 3, scoreline today. They sit in 13th overall after six races, with NZL Olympic place rivals Dunning Beck Logan and Oscar Gunn in ninth place. A work in progress. In the 49er, Brits lead both the men and women’s events. Fletcher and Bithell take a one point lead ahead of Yago and Klaus Lange ARG. While in the women’s FX, Dobson and Tidey won two races to lead by four points from Brazil’s Martine Grael and Kahena Kunze who picked up the other win. The Kiwi battle continues in the Finn between Andrew Maloney and Josh Junior, while Gile Scott had his worst day (12,14) to sit in seventh place. A number of big Finn names struggled today, including Holland’s Pieter Postma (26,17), Ed Wright (21,26) and André Christiansen (36,13) of Denmark. In the Nacra17 Gimson and Burnet jumped-up into second place behind new leaders Gemma Jones and Jason Saunders of New Zealand, while Saxton and Boniface slipped another place to seventh overall. In the Laser gold fleet, Britain’s Lorenzo Chiavarini picked-up his second win, and is just three points off leader Hermann Tomasgaard of Norway. Not to be outdone, Elliot Hanson (4,2) rocketed up the table to sit in seventh overall. Nick Thompson had a tough day, but still picked-up to place 10th overall. Better news from the men’s 470 where Patience and Grube (4,4) move into third place, five points off leaders Anton Dahlberg and Fredrik Bergstrom of Sweden. Wrigley and Taylor (18,3) also closed on the magic top 10, now in 13th place. 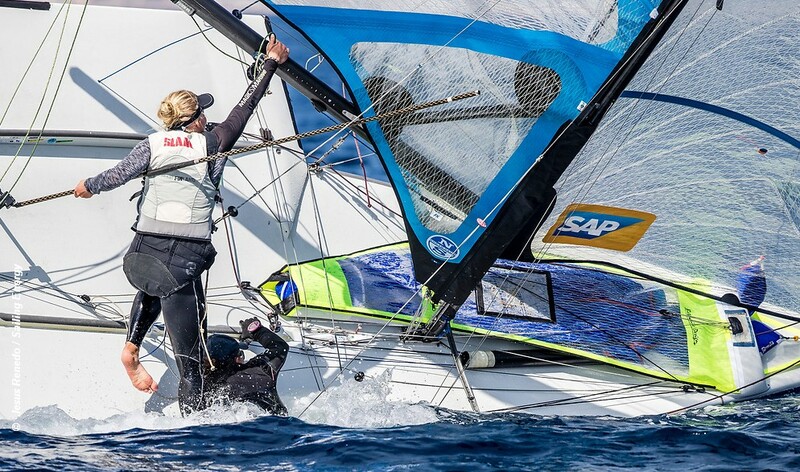 The women’s 49erFX moved into gold and silver fleets to decide the medal race . . . Overall after 6 races – 1st GBR Charlotte Dobson and Saskia Tidey (2,1,1) 23pts, 2nd BRA Martine Grael and Kahena Kunze (1,2,4) 27pts, 3rd NZL Alexandra Maloney and Molly Meech (9,10,14) 47pts. Britain’s Sophie Weguelin and Sophie Ainsworth (12,11,3) now in 8th. The Nacra 17 managed another three races for their gold and silver fleets, resulting in a change of leadership. – Overall after 9 races – 1st AUS Jason Waterhouse and Lisa Darmanin 34pts, 2nd GBR John Gimson and Anna Burnet (3,7,4) 39pts, 3rd ITA Ruggero Tita and Caterina Banti 39pts. Britain’s Ben Saxton and Nicola Boniface (6,25,11) are seventh, and 19th Chris Rashley and Laura Marmion Givannetti. Two races completed in Laser gold fleet with wins for Pavlos Kontides CYP and Lorenzo Chiavarini GBR. – Overall after 6 races: 1st NOR Hermann Tomasgaard 18pts, 2nd GBR Lorenzo Chiavarini (11,1) 21pts, 3rd USA Christopher Barnard 24pts, 4th IRL Finn Lynch 25pts. Other GBR: 7th Elliot Hanson (4,2), 10th Nick Thompson (13,17), 21st Jack Wetherell. Racing in gold and silver fleets Paige Railey of the USA took her first race win in race 5, she is eighth overall. Svenja Weger of Germany won the second race. – Overall after 6 races – 1st DEN Anne-Marie Rindom 9pts, 2nd BEL Emma Plasschaert 26pts, 3rd USA Erika Reineke 27pts, 4th NED Marit Bouwmeester 18pts. GBR: 13th Georgina Povall (27,2), 23rd Alison Young (21, 15), 31st Hannah Snellgrove (44,23). Second day of racing for the 49er and they continue in three flights, and Dylan Fletcher celebrated his birthday by topping the leaderboard. – Overall after 6 races – 1st GBR Dylan Fletcher and Stuart BIithell (6,2,5) 14pts, 2nd ARG Yago and Klaus Lange (2,1,6) 15pts, 3rd AUT Benjamin Bildstein and David Hussl (11,1,1) 21pts. Other GBR: 27th James Peters and Fynn Sterritt (3,11,21), 38th Jack Hawkins and Christopher Thomas. Both miss the cut for the gold fleet. – Race 5 and 6 of the Finn gold fleet completed with race winners Josh Junior NZL and Facu Olezza ARG. Overall after 6 races – 1st NZL Andrew Maloney 10 pts, 2nd NZL Josh Junior 19 pts, 3rd ARG Facu Olezza 23 pts. The men’s 470, racing in gold and silver fleets, sees a change in the top of the leaderboard. – Overall after 6 races – 1st SWE Anton Dahlberg and Fredrik Bergstrom 23 pts, 2nd AUT David Bargeher and Lukas Mahr 25 pts, 3rd GBR Luke Patience and Chris Grube (4,4) 28 pts. Britain’s Martin Wrigley and James Taylor (18,3) are 13th. In the women’s 470, racing as one fleet, Luise and Helena Wanser of Germany win both races and move into fourth overall. – Overall after 6 races – 1st FRA Camille Lecointre and Aloise Retronaz 18 pts, 2nd GBR Hannah Mills and Eilidh McIntyre (5,2) 19pts, 3rd CHN Mengxi Wei and Haiyan Gao 30 pts. Britain’s Amy Seabright and Anna Carpenter are 32nd. Three races completed today with Maya Morris returning after missing two races to score a 2 and 1 but then miss the final race, she is 22nd overall. – Overall after 6 races – 1st CHN Yue Tan 19pts, 2nd HKG Hei Man Chan 20pts, 3rd CHN Jie Du 30pts, 4th THA Siripon Kaewduangngam 34pts. Britain’s Bryony Shaw did not race. Three more races for the men with Mateo Sanz Lanz (3,2) SUI confirming his lead before not racing in the third race. – Overall after 6 races – 1st SUI Mateo Sanz Lanz 16pts, 2nd CHN Hao Chen 21pts, 3rd HKG Michael Cheng 33pts. Britain’s Andy Brown who won a race Tuesday, did one race and then withdrew Wednesday. The RS:X sailors are taking part in their European Championships straight after this regatta at the same venue, so there is a lot of dipping in and out. Trofeo Princesa Sofia Iberostar – How has it gone to date?